Just 9 days left till Marathon time! I was very excited yesterday when I received my shirt. I decided to order this shirt as an option not to have to wear a paper bib. Seemed convenient enough as I will be wearing a water belt and I don’t want to be dealing with so many things. And it is also a great souvenir for my first marathon! For the next week and a half, I will continue my workouts as usual and but will start to minimized intensity level and not to feel sore for the race. 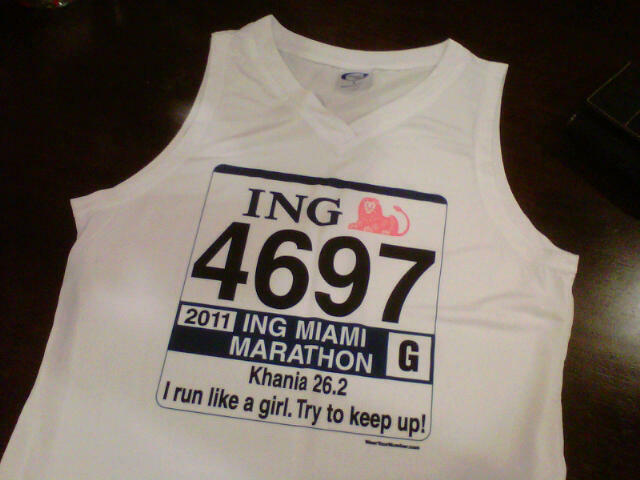 Next weekend will be packet pick up at the Miami Beach convention center. There I will get an ING logo shirt along with some goodies. Vendors will also be available for any last minute thing one may need or just to do a little shopping at discounted prices. Can’t wait!!! Have a great weekend everyone! I am so proud of u K! u r so motivating 🙂 Love the shirt…I think u run more like a machine !